2012 NBA Draft: Who will be a superstar? This entry was posted on June 28, 2012 by Sports Traveler. With the first pick in the NBA Draft the New Orleans Hornets select..... Well I think we all know that Anthony Davis is going number 1 overall. However, the rest of the first round is really up in the air. The draft is pretty deep this year and there are a lot guys with the same talent level. This makes it difficult to predict how the first round will turn out after Davis is drafted by the Hornets. Another factor that makes this draft hard to predict is the vast trade possibilities. The Rockets have picks 12, 16, and 18 in the first round and there are still many reports out there that they may not be using any of those picks. Houston has been battling for leverage in the Dwight Howard sweepstakes and they might be able to come up with the best offer on draft night. The obvious risk for Houston is assuming that Dwight will resign with the team following the 2012-13 season. If the Magic don't trade Howard by next season's deadline then they will suffer a tremendous loss with nothing to show for it. I honestly don't even think it is a good idea for the Magic to resign Howard anyway. He clearly wants out and his contract would limit free agent signings in years to come and the signing would most likely leave Orlando in NBA hell for most of his max deal. Also, be on the lookout for the Bobcats to possibly trade their number 2 pick. The Jordan era in Charlotte has been one to forget and wholesale changes are needed. After setting the record for worst winning percentage this team has more holes than MJ's favorite golf course. Struggles under a Jordan front office has been a common theme in his post-playing career. The Bobcats need to be a lot more cautious with their trades, signings, and draft picks. 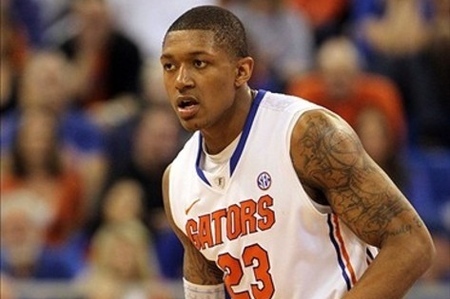 In my opinion they can start 2012 off on the right foot by drafting Bradley Beal. If they do end up trading the pick, the Bobcats better make sure they are building for the future with young talent that isn't overrated. The Lakers are another team that is fishing for a deal as we approach tonight's draft. The Lakers have had 2 mediocre seasons since legendary coach Phil Jackson decided to step down as head coach. The Pau Gasol trade rumor has been floating around since his struggles began last season. Kobe Bryant has also been vocal at times about Pau's performance and essentially calling him out for not producing like his contract and skill set dictates. I honestly don't see a deal going down tonight but you never know. The draft always generates crazy trades and shocking moves. My prediction is that there are at least 5 trades in the first round of tonight's draft and at least one of those 5 will include marquis names. Unfortunately I can't support that prediction with much evidence right now but I'm going with my gut feeling on this one. Who will be a future superstar in the NBA? Are there any in this draft? What is an NBA superstar? First of all I will address what I think is an NBA superstar. I think an NBA superstar is someone that is in the top 5 in the league at their position and a game changer both physically and mentally. To draw a distinction, Dwyane Wade is a superstar whereas Chris Bosh is just simply a star. I think this draft is full of potential stars but the possibilities for a superstar are slim. The first names that come to mind are Michael Kidd-Gilchrist, Anthony Davis, Bradley Beal, Harrison Barnes, Thomas Robinson, and Andre Drummond. Of all the names in the hat there is only one with superstar potential... and its not who think. All of these players have talent and should be strong contributors in the NBA. However, only one sticks out to me as a play maker who could eventually become the type of player who can put a team on his back. That player to me is Bradley Beal. After watching Beal play this season I am convinced that this man will be a stud in the NBA. He is a great athlete with a shooters touch and an impressive understanding of the game for his age. He is an all-around player that will makes his teammates better. If this were Mel Kiper's Big Board I would put Bradley Beal at number one. Green to end up on contenders. Should be a great draft. Looking forward to trades and draft snubs. Enjoy the draft tonight folks.